Many players who have access online casinos in the past will be familiar with the RTG name as this company has created many amazing slots over the years. One of the games that are quite popular is Bubble Bubble, a Halloween themed game that offers 50 paylines, but remains an affordable choice. This video slot game is loaded with added features that can generate massive wins and it can be played for free as well as for varying real money bets. Bubble Bubble can also be played on mobile devices, so players will always have ways to enjoy this fun filled game. Even though there is no progressive jackpot. The RTP of over 95% will let players know they can generate some large rewards, including the base game jackpot that offers 1000 coins. Bubble Bubble is a great game for players who are on a budget and even though the game offers 50 paylines, it has some betting amounts that will appeal to all players. It can be enjoyed by low, mid and high rollers and there are some great chances of winning. The game is graphically intense and players will enjoy the bold colours that appear on the screen. The symbols are thematic and include black cats, cauldrons, frogs, ravens, spellbooks, spiders and more. With great game features that are also themed, this game is a pure joy to play. HOW TO PLAY Bubble Bubble? The game is played like any other video slot from RTG or other providers. Players will start by choosing the number of paylines to cover and will then select a bet amount. The game starts with small bets at just €0.25 for all 50 paylines and this can be increased to as much as €250, which will appeal to those with larger casino budgets. This game also allows players to toggle sounds on or off and they can play as many as 1000 spins automatically with the Autoplay feature, which can be enabled at any time prior to a spin on the game. The excitement from Bubble Bubble comes from the bonus features that are offered and these are where many of the largest wins will be created. Wild and Scatter – The Wild Witch can appear on the middle reel of the game and will take the place of all symbols, including the scatter icon. When it does appear, it will become an expanding symbol and will multiply all wins by 3x. The scatter is the cauldron and will offer instant wins when two or more appear, paying between 2x and 33x the normal amount. These wins can be tripled if a wild also appears. Scatter Features – When three or more scatters appear, one of three bonus rounds will begin. The Bewitched Feature offers 7 free games with a wild on reel three, The Great Ghost Feature offers 20 free spins with as many as 9 wild ghosts and the Wild Witches Feature has 9 free spins and reels 1 or 2 can become completely wild. 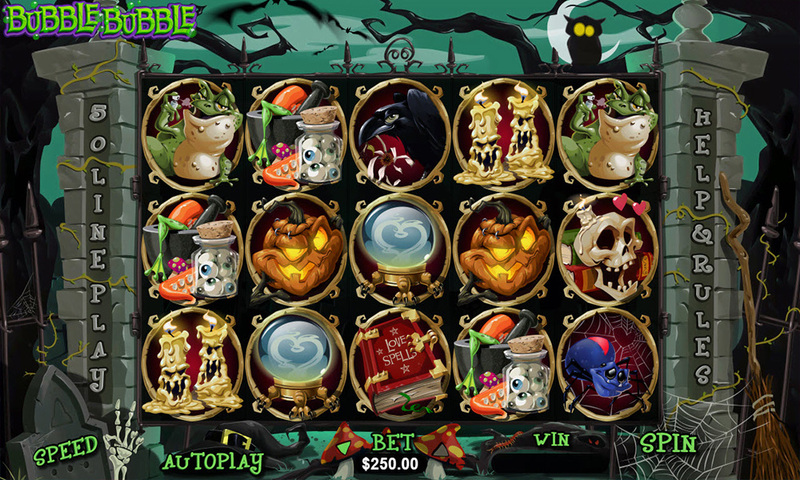 Bubble Bubble is a great Halloween game that can be found at most leading RTG casino sites. It offers multiple bonus features and some high payouts and when the wild is in play, players can enjoy triple rewards. This medium variance game offers an RTP of over 95% and will be an affordable option for any real money player online. Players, we need your help with how we should to rank and rate these reviewed casino games. You can help us by rating this game, and if you really enjoyed playing Bubble Bubble. You can also share it with your friends on Facebook, Twitter and via email. For all freeplay games, if your free credits run out, simply just refresh the page and your balance will be restored.